Millions of priceless artifacts were engulfed overnight in Rio de Janeiro on Sept. 2, 2018. What can this teach us about protecting history in the face of disaster? On Sept. 2, 2018, billows of smoke rose from Brazil’s National Museum (Museu Nacional). The inferno caught international attention as thousands gathered on the streets, watching helplessly as the building burned. A few passionate researchers ran inside and were able to rescue a small selection of items, but the fire was ruthless. Most of the priceless artifacts spanning 11,000 years of history were engulfed overnight. Amazingly, there were no human casualties in the fire, but the cultural loss is unprecedented. “Insurmountable,” “irreparable,” “devastating” were words used by Brazilian officials to describe the event. Weeks later, as shock has begun to wear-off, the focus shifts toward the future. What can we learn from this event? 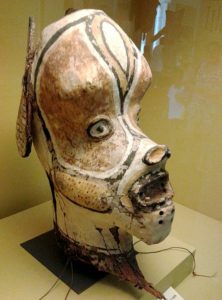 Indigenous Tikuna mask, date unknown . It was part of the collection at Brazil’s National Museum and may have been lost to fire. says Adele Nelson, an assistant professor of art history at The University of Texas whose work focuses on the postwar and contemporary art of Brazil. Stephennie Mulder, an associate professor of art history who works on the conservation of cultural heritage in Syria, agrees we need to rethink how cultural heritage is valued. “In Brazil and around the world, a contentious battle is playing out over whether museums and other cultural and artistic institutions should receive government funding,” she says. Preventing future loss starts with coming together as a society in support of collections and their importance, believes Mulder. We reflected with Nelson and Mulder on the fire at the National Museum and discussed the value of culture and how it can best be safeguarded when disaster strikes. Q. Is there a way to calculate that social, historical, monetary value loss in the fire at the National Museum of Brazil? Stephennie Mulder: Imagine a fire destroying the Metropolitan Museum of Art or the American Museum of Natural History. These comparisons help us grasp the scale of the loss and the unknowable blow to future knowledge, as well as the institution’s status as a living civil monument frequented not just by researchers but generations of school children and families. Adele Nelson: The loss to the cultural patrimony of Brazil and the world is incalculable, as is the loss for research, particularly in the natural and social sciences. The museum was 200 years old, and it was the largest scientific institution in Brazil, with some 20 million objects and specimens in its collections. Q. What objects or artifacts would you identify as the most significant losses? Mulder: The most catastrophic loss is arguably the anthropological collections, including feather work, masks and pottery made by indigenous peoples of South America, and perhaps more tragic, a large corpus of audio recordings of indigenous languages in Brazil, some from nations that have disappeared. Nelson: Among the singular holdings lost in the fire were Luzia, considered one of South America’s oldest human fossils; and the fossilized bones of a dinosaur, Maxakalisaurus, which was unique to what is now Brazil. The museum also held ancient artifacts from other cultures, from Egyptian mummies and frescoes from Pompeii to European rare book collections. “The Open Road” is Calling. Where Will It Take You? In the case of the Museu Nacional, the answer is all too simple: money. Q. What should have been done to better protect the art and artifacts in the museum? Nelson: In the case of the Museu Nacional, the answer is all too simple: money. In Brazil, conversations about cutting-edge preservation practices such as digitization, 3D scanning, and duplication were on a waitlist behind addressing much simpler needs – for example, the installation of a fire sprinkler system. The annual budget allotted to the museum was a paltry $128,000. Upgrades, including a fire suppression system, had been pleaded for by museum workers for decades. Only this year did the government respond, promising a $5 million package, but sadly, that action came too late. Q. As you mention, many experts have called for the need to digitize museums as a safeguard against tragedies like this. How feasible is that for an entire museum? Mulder: Digitization is a powerful tool. It can preserve a copy of an object as well as a description of its significant features in a format that is easily transferable, easily shared, and easily duplicated. Digitizing collections is a worthy goal for any cultural institution. But digitization is not a panacea, and it has a number of major drawbacks. First, it’s expensive, both in terms of equipment and in terms of human capital. A recent digitization project at UT Austin’s Archive of the Indigenous Languages of Latin America (AILLA) archived the collection of renowned Mesoamericanist Terrence Kaufman, but it could only be pursued because of a grant from the NSF for $302,627 – more than twice the budget of the Museu Nacional. Q. Does digitization make up for the loss of the physical items? Nelson: Beyond the expense, there is the question of authenticity. No photograph, no 3D model can capture the surface texture or the dusty scent of a Pompeiian fresco. Nor can digitalization allow for DNA analysis. Q. Are other museums at risk for this same tragedy? Is this mostly a risk within developing countries, or is this an issue for the most well-funded museums? Mulder: Museums are always subject to risk. In wealthier countries, museums sometimes develop sophisticated risk-management systems that enable them to mitigate risks from natural disasters like fires and flooding. In Houston in the fall of 2017, for example, during Hurricane Harvey, the Museum of Fine Arts, the Menil Collection and the Houston Museum of Natural Science all had plans in place that protected their holdings – including, in the case of the HMNS, off-site facilities to house the museum archives that were built to withstand a Level 5 hurricane. That’s the good news. The bad news is that just as in Brazil, museums, archives and libraries around the world are subjected to a battle for survival of a different sort, in the form of seemingly ever-decreasing funding.